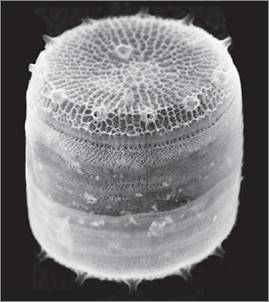 Diatoms, sometimes called “the oceans’ Amazon forest”, are abundant unicellular photosynthetic algae found across Earth’s oceans. They have cell walls made of intricately patterned, species-specific silica glass. They produce up to 20 percent of the world’s oxygen, largely contribute to the natural oil reserves, and synthesize silica in a metabolic process called biosilicification. Now, with a new grant award from the Gordon and Betty Moore Foundation’s Marine Microbiology Initiative, Wyss Core Faculty member Pamela Silver, Ph.D., and Wyss graduate researcher Jernej Turnsek will investigate which genes are responsible for diatoms’ ability to produce silica, in hopes that their metabolic processes might one day be harnessed for sustainable production of valuable commodities. The new effort by Silver and Turnsek, which is a joint effort with a team from Stanford University, is an exciting foray into the frontier research field investigating the microbiome of the Earth’s oceans. The recent Tara Oceans expeditions, an organized effort to understand how climate change and ecological disruptions are impacting the world’s oceans, have illuminated the diversity of marine species and their genes making up the marine microbiome. “The realization that we know so little about the Earth’s oceans, along with the advent of modern experimental techniques such as next generation sequencing and advanced microscopy methods, prompts me to believe that some of the major advances in the fields ranging from basic biochemistry, enzymology, metabolism, signaling, microbial interactions, and ecology, to medicinal natural products discovery, biomaterials, biogeochemistry, and origins of life will come from the oceans over the next few decades,” said Turnsek. Silver and Turnsek plan to investigate which proteins facilitate the diatoms’ ability to biosynthesize silica using proximity-based proteomic mapping in the diatom species Thalassiosira pseudonana. Their goal is to understand how naturally occurring biosynthesis processes, such as the self-assembling method that diatoms use to construct their silica cell walls, could lead to future biomimetic strategies for producing nanomaterials.